Silk’s natural properties of lightness, strength and breathability make sleeping in a Silksak sleeping bag a pleasure. Silk will help keep you warm if you are cold and cool if you are hot. When travelling in warm climates a Silksak is the perfect lightweight alternative to a regular sleeping bag. You’ll feel cool and comfy as your Silksak keeps your skin dry and your temperature down PLUS gives you protection from biting insects. When used inside a sleeping bag your Silksak adds extra warmth, working with you to keep your body temperature even. It also extends the life of your sleeping bag by keeping it clean inside PLUS the fine, smooth fabric reduces unpleasant tangles in the night! * Above prices except for NZD are approximate. Final checkout in NZD. Silksaks are very soft and extremely lightweight. 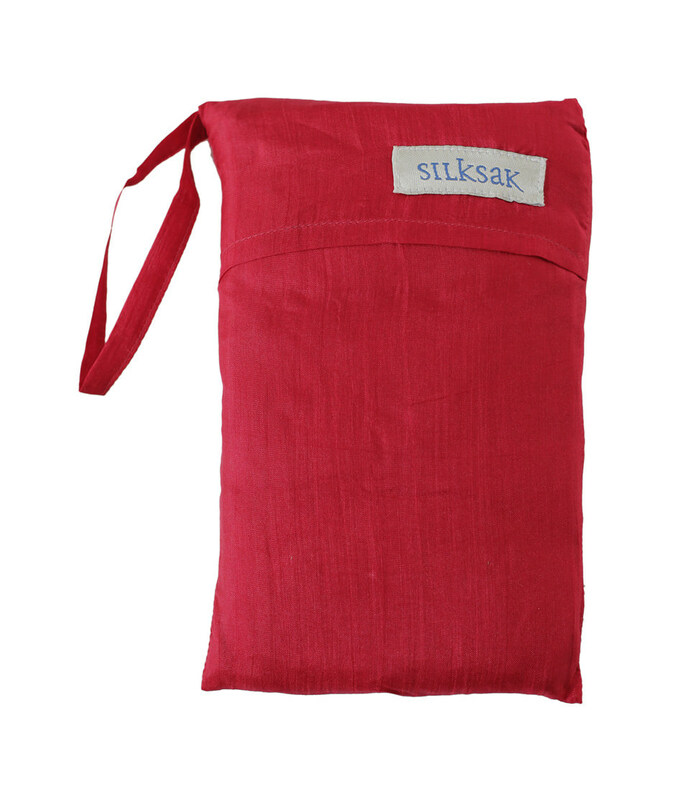 Each Silksak can be stuffed into it’s attached stuff-bag for storage. A Silksak will take up minimal space in your luggage. A single silk fibre has a tensile strength equal to steel wire of the same diameter. Our fabrics are very strong and durable. They will not go into holes or rip easily. Silk keeps your skin dry because the hygroscopic silk fibre absorbs one third its own weight in moisture without feeling damp. The absorbed moisture is evaporated into the environment or absorbed by outer clothing layers. Your Silksak also dries fast. Silk is a completely natural fibre. Silk is one of the safest fibres you can wear next to your skin because it is naturally flame resistant. Where synthetics melt, silk burns to harmless ash. Winter and Summer, your Silksak provides thermal balance. Use your Silksak to add luxurious warmth in winter to your regular sleeping bag. In summer or in tropical climates, use it as a super-lightweight, breathable bag on its own. It will keep you cool and keep biting insects away. 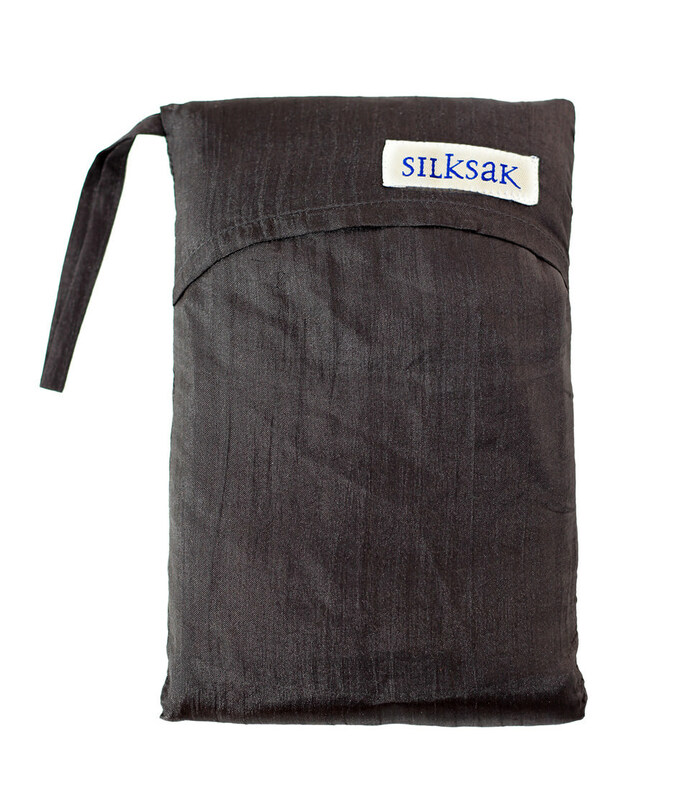 A Silksak is the perfect travel companion. Many fabrics claim to feel “soft as silk”or “silk weight” but what could be better than the real thing? Synthetic fibres such as polyester and microfibres were first developed last century from a desire to imitate the precious silk fibre. But silk has unique properties that no manmade fibre can imitate. Silkbody founders, father and daughter team David (right) & Emily Cooper (left), with new owner Laurian (centre). All travellers look for the perfect product to make their journey as comfortable and enjoyable as possible. While travelling in Vietnam in the early 1990s, Silksak founder David Cooper discovered that lightweight, luxurious silk was the best fabric for sleeping in. He found that natural silk kept the body cool in hot and humid conditions, was great for keeping mosquitoes and other insects at bay and washed and dried quickly and easily. On returning to New Zealand he found that a silk liner was ideal for using inside a sleeping bag for adding warmth, keeping the bag clean and reducing tangles. It quickly became an essential item for tramping and camping trips, being lightweight and compact too. The Silksak silk sleeping bag liner that is manufactured in Vietnam to David’s specifications has now been selling in New Zealand and Australia since 1995. Silksak silk liners are also now available in the United Kingdom and Europe. Each Silksak is made of the finest fibre spun by the tiny silk caterpillar, creating an incredibly lightweight, luxurious finished product essential for travelling and nights spent in the outdoors. In 2002 our fascination with silk that had started with the Silksak, led us to create Silkbody, a range of natural silk clothing for everyday, outdoor and travel wear. Silkbody is now owned and run by Laurian Godwin. ENVIRONMENTAL ISSUES ARE AT THE FOREFRONT OF OUR COMPANY’S OPERATIONS. By its nature, sericulture (silk production) is earth-friendly. The mulberry leaves eaten by the silk caterpillars that spin the silk are a renewable and sustainable crop as the trees produce year after year. They are replaced after 8 years, after which they are not such vigorous growers and the leaves are not so tasty. No pesticides can be used on the mulberry trees. The silk caterpillars themselves demand the purest and best quality leaves as their food. Silk fibres are highly absorptive and are easily dyed using low-impact fibre reactive dyes. We do not add any treatments to improve ant-static, flame retardance, wash-and-wear or anti-bacterial properties because silk is already naturally endowed with these properties. Silk is also biodegradable and will decompose easily in landfills. The Silksaks are manufactured by a family company in Vietnam. Social and ethical standards are maintained in all factories. Employees are paid reasonable wages and management personally visit the factories regularly to ensure standards are being met. Silksak store display stands are made from environmentally-friendly materials such as recycled wood, natural paints and waxes. Box packaging is made of recycled cardboard and printed material is printed on paper from sustainable forests using biodegradable inks. At head office all office cardboard and paper is recycled or re-used. Through the Waste Exchange program run by the local council, we donate excess packaging waste, such as cardboard, tissue paper and plastic bags to community organisations, schools and kindergartens for use in projects and teaching. © Silksak. All Rights Reserved.